The first Earth Day was held on April 22, 1970 with 20 million Americans rallying for a healthy, sustainable environment. This single event is credited with kicking off the modern environmental movement, which is still going strong 45 years later. Today, the movement involves companies such as Apple, which is a supporter of Earth Day and a strong proponent of corporate environmental responsibility. As a result of this commitment, Apple is conscious of what materials it uses in its devices and strives to minimize the environmental impact of what it produces. So what exactly goes into some of these devices that Apple makes by the millions? 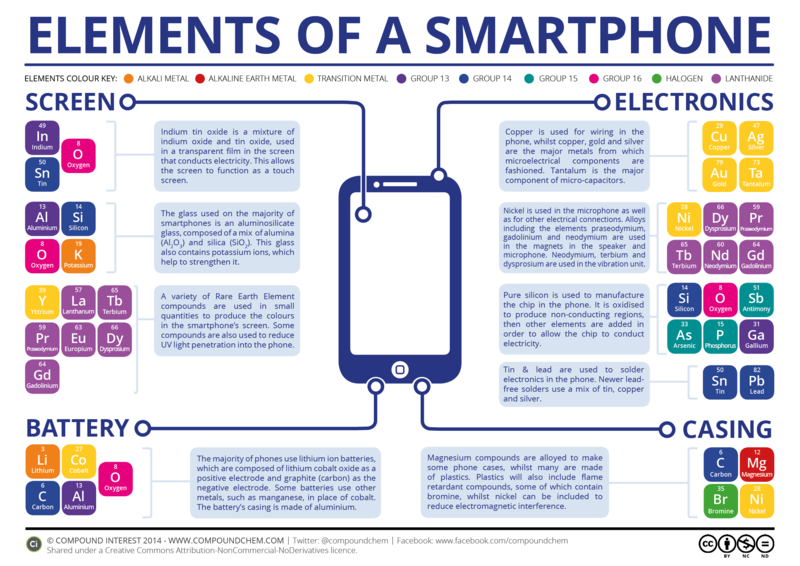 The American Chemical Society has the answer with an infographic and video that showcases the major elements used in the iPhone 6. Like most smartphones, the iPhone contains approximately 300 milligrams of silver, 30 milligrams of gold and trace amounts of rare elements like praseodymium, gadolinium and terbium. Other elements include nickel in the microphone; indium, tin and oxygen in the touchscreen matrix, and aluminum and magnesium in the casing of the phone. You can check out the full list in the graphic above (click on it for a bigger version) or take a tour in the video below.